If you know me then you know that every Halloween I take a great deal of pride in a small cemetery display outside my front door (and you’ve probably seen it in person). Every year the stones are placed a little bit differently, and every year I get at least one new stone (this year, I got five, because my husband found pieces that were beyond your standard R.I.P. fare). Here’s a tour of this year’s Cemetery of the Dolls. Happy Halloween! This sign has lasted many years because it’s really just cheap plastic (if you look in the upper left corner, you can see one of the two holes used for hanging it on the store rack). This is one of the very first stones I bought years ago. The idea for the cemetery came from the purchase of this stone (and one other). This unique LOST AT SEA headstone my husband found for me is the newest addition to the collection. Sadly, this will probably go at the end of this year — it’s one of the few styrofoam (I used to do a lot with styrofoam, but over the years I’ve added more solid pieces). This is one of my older stones. Kitty’s eyes look a little worse for wear, but some wear makes the stone look more authentic. A friend of mine gave me this candle holder as a gift. It has been a part of the Cemetery of the Dolls for many years. The little RIP stone that’s crowned with skeletons may not make it beyond this year. I’ve had it for several years, but it’s made of a cheap plaster material that absorbs water. The piece is crumbling. This wolf guards the cemetery’s western edge. The cemetery has so many stones now I need more candles than ever before to keep it lit. In the past I’ve only needed three or four. This year we made the jump to seven. I can’t blame house guests for wanting to have a little fun! She’s a sailor, so she really wanted a shot with LOST AT SEA. 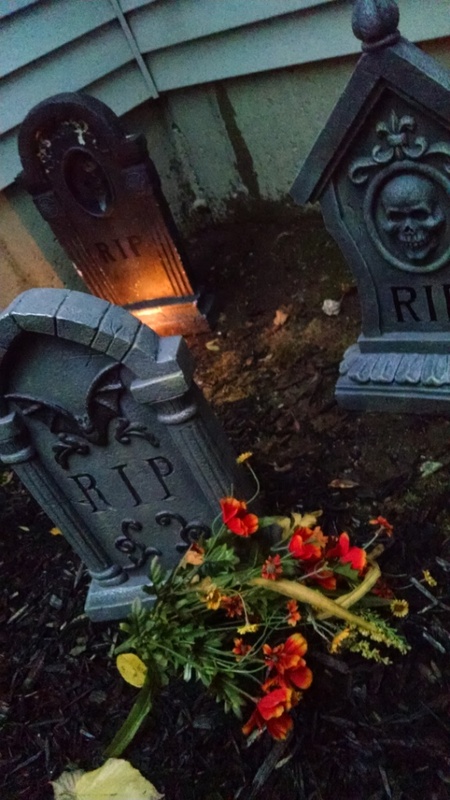 Posted on October 13, 2015, in Deep Thoughts & Fun Stuff and tagged fake gravestones, Halloween cemetery displays, Halloween decorating ideas, Halloween decorations. Bookmark the permalink. 2 Comments. love your posts and your scary stories… especially around Halloween. Way to go Kristi!! Also… Kristi … you should check out the “haunted yard” at the Old Wells House at the top of Wells Street .. Brewster NY. I brought my teenage nephew to see it when he was in town from AZ years ago and he loved it.. great for kids and adults… interactive displays and a must see Halloween Display.